>When I was very young – when, remember, Mars Bars were so much bigger, summers were hotter and it always, always snowed in winter – the new girl at school asked what snow was like. After watching me perform the six-year-old equivalent of a spluttering “Whaaaa-aa?? ?” gesture, she explained that her family had just moved from Oman, and she’d never seen snow. Now try, with mind of a child, to describe snow in a way that fully conveys the excitement, fun and finger-ruining coldness, without using the phrase, “It’s snowing! It’s snowing!” and running round in ever-decreasing circles. So: Today’s New Band are Rev. Peyton’s Big Damn Band, and they’re just…ace. Making the kind of gravelly, satisfying Blues that can only come from North America, Reverend Peyton has a voice of such barrelling intensity that mere humans cower in his presence. 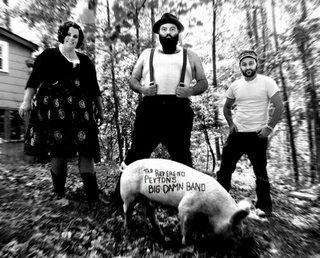 The Big Damn Band‘s songs pick themselves up, shake off the dust and spring immediately to clattering, shuffling, howling life. Mama’s Fried Potatoes, swaggering, grunting and with more swing than seems fair, manages to be everything you’d expect and everything you’d want all at the same time. Your Cousin’s On Cops hops, skips and skitters; speeding up, slowing down and belligerently shoving Rev. Peyton‘s chunky rhymes into your willing ears. I’d Love You Baby is further proof of the band’s firm grasp on exactly what an audience needs – a song to dance to, a melody to sizzle in your brain and a subject to grab you by the groin, the heart, or both. Rev. Peyton’s Big Damn Band has so much belief, fun and heart that you realise what rare commodities they are. If you like songs that’ll make – no, force – you to move at least one part of your body in time, then look no further than their rabble-rousing, good-time, heart-and-soul, all-or-nothing songs. Brilliant. >What is it that makes us view Welsh bands differently? Even when a song from the litany of fabulous Welsh bands such as Super Furry Animals and Gorky’s Zygotic Munki sing in English, there’s something indefinable that separates them from their British counterparts, at least. Today’s new band, Genod Droog, also have this – with the twinkly space-yness of Gorky’s and the full-on mentalism found in the Furries‘ crazier moments. Oh, and they’re hip-hop. Yup, and rapping fits Welsh as well as it does French: brilliantly. While this might be a novelty enough to just to hear it in action, Genod Droog have tunes in spades too. Listen to Gwn Tatws on their MySpage page and try and stop yourself from singing along in your best attempt at Welsh while their blend of Psych-Rock-Hip-Hop bombards your ears. Then marvel that the song is about veg of champions – the potato (at least I think so; my very basic knowledge of Welsh is fallable). Best of all is Bomiwch y Byd – the kind of song that reeks of summertime and would sound best if heard sitting a sunny Welsh field, sipping a cider. Fortunately for us mere mortals, this will be possible soon – they’re playing a bunch of gigs around the fantastic Welsh summer festival circuit. Welsh bands seem to have an innate ability to do the simple stuff – i.e. tunes – and making it work well, weirdly, and wonderfully. 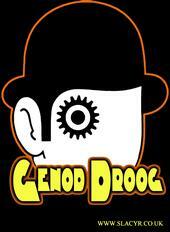 Genod Droog do this too – listen now and then catch them if you can. Finally, another ANBAD radio show will be up very soon, over the weekend, barring technical mishaps/Internet hell/death. Marvel at its glory! Listen to voices talk in between this week’s greatest songs! Free! All those things – and more! Don’t forget, if you have a great band we should listen to and put on A New Band A Day, email me and tell me all about it. We listen to every band you suggest, promise!